Add video to a product page. Connection to third-party video streaming websites like YouTube, Vimeo. Zappos, Gucci, Apple, Samsung and lots of other noted brands have long ago unveiled the power of product videos and are now making full use of it. And you are now a click away from the extension that may help you add product videos to your store effortlessly and quickly. Video Tab will place a separate video on every product page you choose to catch your customer’s interest, highlight the product features and show off all its benefits in real time. 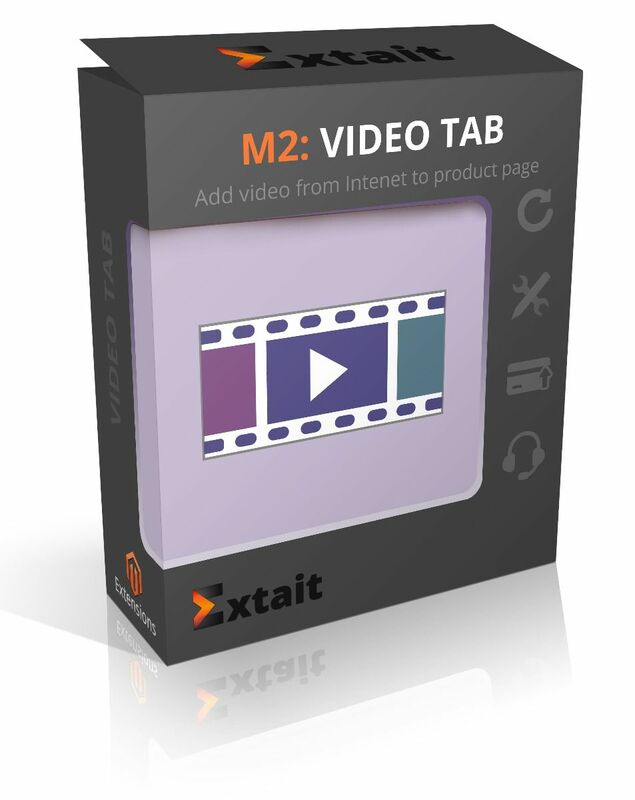 Video Tab allows adding videos to your store from different sources (YouTube, Vimeo) via embedding the video code. Within less than a minute you can add a title, description, link, and label, paste the code and your video will appear on a product page following the product description. Rather than making your customers read tons of text, offer them quick and informative videos they can view without leaving the page. Video content helps improve conversion rate as visual perception is the most vital and influensive for humans. Select the best videos, add them to your online store and watch your sales growth. 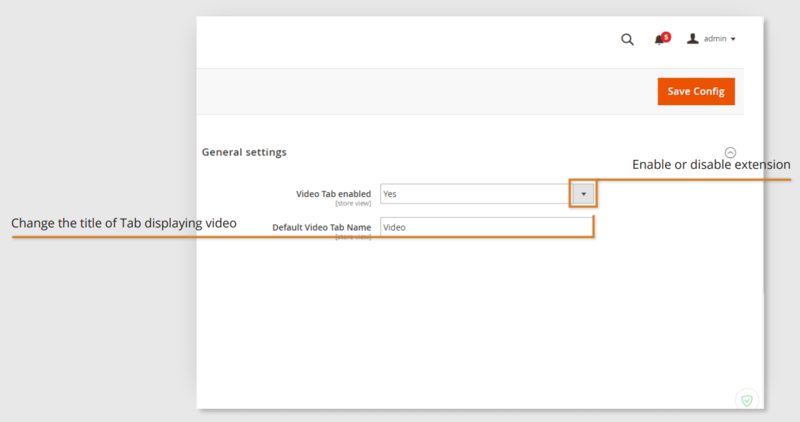 You may quickly enable/ disable video in your store in the Store’s Configurations -> Modules -> Video Tab. 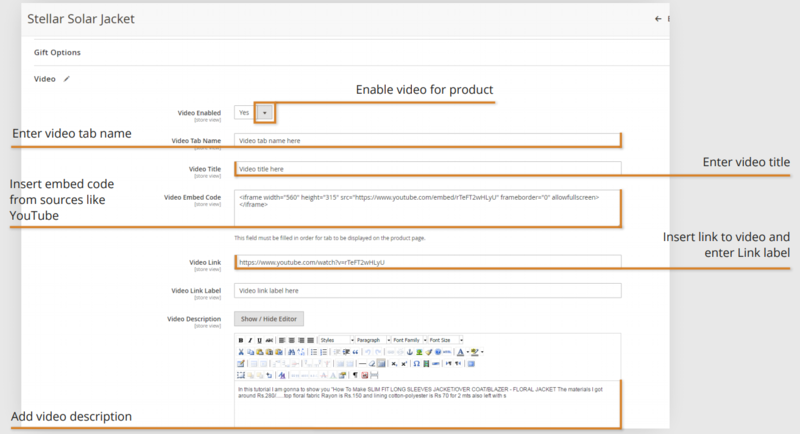 Once enabled, it will place a Video Tab option on products’ pages where you may further upload videos. If disables, it will hide the Video option for all products. On a product information page in “Video” tab you need to specify a video title, description, link, label and paste video embedded code. You may get one at a YouTude\Vimeo video page if you click "Share" button. Just copy the code and paste it into the relevant extension’s field and that's all. The extension displays a separate Video tab on the product page. Your customers can view videos without leaving the product page. - Compatibility with Magento 2.2 was added. - Video description style (e.g. "bold" and "italic") is applied to the site footer and video link. - If the module is disabled, product configuration page is displayed without main settings of the product.